Exciting news! The Drabblecast is back! I love this audio production. It has sound effects! And music! And artwork. If you enjoy both speculative fiction and the audio format, be sure to click through and give The Drabblecast a listen. It’s one of those mornings where it’s so bright outside you’re convinced it must be warm as well. It’s a balmy negative eleven at the moment. It’s a good day to stay inside and write or read or really do anything that doesn’t involve opening the door to the outside. A quiet week this week–I think everyone is hibernating. No rejections and I didn’t send anything out, either. I did manage brand new words after finishing up the brainstorming and outlining of episode 3. And that’s about it for this cold, cold day. None, but if you haven’t listened to Ghost in the Coffee Machine over at The Drabblecast, you really should. I’m still so excited about what a wonderful production they put together. Oh. Well. Look at all those rejections. Here’s the thing: while I knew I had rejections this week (obviously), the number didn’t strike me until I counted them up for the weekly check-in. That’s the magic of sending things out on a regular basis. It’s not that you’re suddenly immune to rejection or it’s somehow fun for you. You just sort of … forget about it. You take the story that came back, find a new, appropriate place to send it, and log the new submission. Because logging new submissions is fun. In other news, despite the holiday, I finished up the short story I was working on, did some more brainstorming on episode #3 for Coffee & Ghosts, Season 2, and some played around in Photoshop. In really cool news, Ghost in the Coffee Machine is out in audio from The Drabblecast. It was so incredible to listen to this. I love audio stories to begin with, and they did such a wonderful job. It also got me all excited to work on more Coffee & Ghosts stories. 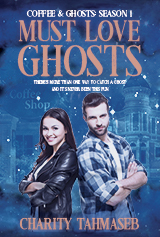 Ghost in the Coffee Machine … in audio! Head on over to The Drabblecast and give it a listen (or find the podcast on your phone). It has sound effects! Music! And some very nice artwork as well. I couldn’t be more pleased with the production. They did a tremendous job.